My Subaru Impreza kept me safe when I got t-boned! I am a forever customer. This is my second Subaru, as my 2008 Subaru Impreza WRX got T-bones and kept me safe due to all the side airbags going off. After that we definitely wanted another Subaru. I think it has great visibility, pretty good ground clearance for off-road trails, and overall a good size and comfortable for long distances. My model also has Bluetooth and such, something is annoying when there are two phones in the car trying to sync, hard to sort them out and have to turn one off. After that sometimes it takes a bit to find the other one on the interface of the dashboard. Also, we keep the back seats down with a fitted sheet over it for our dog to always ride in the back and she loves just jumping right in and looking out the window. Good to have the plastic coating on the back seats so we can clean it easily. Having the Impreza sport is nice in Seattle and the drive performance is good for a quick lane change too! The Impreza is perfect for quickly changing weather. Only drawback; pricey tires. We love our Impreza wagon. It is AWD system makes it an ideal car for living in Colorado where weather can be sunny and summery one day and snowy and icy the next. The biggest issue we've had is that we chose the sport edition with the larger wheels (and therefore thinner tires). We live near the center of a city with quite a bit of construction and have had to replace a few tires. Unfortunately with AWD systems, the tires have to had the same wear on them or it can seriously harm the system so we have had to buy 2 complete sets of tires in only 4 years owning the car. Seat warmers are amazing as we head into the colder months. The Bluetooth does seem to have a hard time switching between connecting to my phone and my wife's phone, but generally works quite well. Overall it is a wonderful car for us! 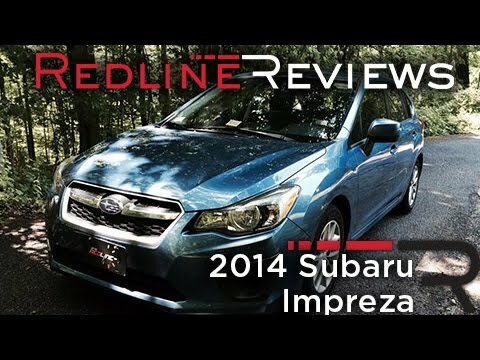 The 2014 Subaru Impreza is a great, dependable car brand. First the good things about my car are: All wheel drive. Great in the snow. Heated seats. Back window windshield wiper. Aux cord input. Bluetooth. Heads free phone call and answering in the steering wheel. Very easy to keep maintenance on. Great gas mileage. Problems: Tire sensors are too sensitive, especially in the dead of cold weather below zero. The beeping for the lights are still on could be louder as well. Performance: Great in snow. Smooth gear shift. Reliability. Very, it is always started. Comfort:. The back window could be bigger. More cup holders in the car.